Bexhill Cricket Club’s first team was edged out in a tight contest at home to Billingshurst. The Polegrove-based side went down by 14 runs in Sussex Cricket League Division Two on Saturday having at one stage required 18 runs for victory with three wickets left. Byron Smith charges in at The Polegrove on Saturday. Billingshurst, who are up to third in the table, recovered from 65-5 to post 207-9 declared in 51.5 overs after being asked to bat. Bexhill dismissed both openers with the score 26. Joe Sarro struck first by having Tom Haynes caught behind by Will Smith for eight and Byron Smith then trapped Tim Weston leg before for 12. After passing the 50 mark, Billingshurst lost three wickets for 13 runs. Shawn Johnson had Stuart Barber caught by Cameron Burgon for nine, Neil Blatchly pinned Scott Stratton leg before 13 and Johnson had Paul Osborne caught by Ian May for a third ball duck. Back-to-back fifty partnerships, however, got Billingshurst back on track and checked Bexhill’s charge. 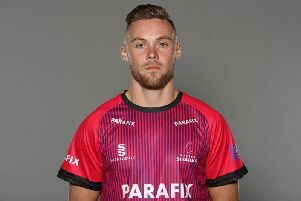 Jake Cross smashed 49 off 31 balls with nine fours and a six before being dismissed in unusual fashion, hit wicket off the bowling of Danul Dassanayake. That wicket ended a sixth wicket stand of 57 between Cross and Andrew Miller, who then put on 63 for the seventh wicket with Andy Barr until Miller was caught by May off Blatchly for 32 to leave Billingshurst 175-7. The eighth and ninth wickets went down with the score 186. Blatchly firstly held a return catch to dismiss Rob Woodman for six and Barr was then bowled by Matt Peters for 34. Shane West (13 not out) and Ben Williams (7 not out) added 21 important runs for the final wicket to get Billingshurst past the 200 mark. Six of the seven bowlers used by Bexhill picked up wickets. Blatchly was the most successful with 3-52 from 19 overs, Johnson took 2-34, and Byron Smith, Sarro, Dassanayake and Peters ended up with one apiece. Bexhill were all out for 194 in 45.2 overs in reply as they narrowly missed out on a fourth victory in their last five home matches. Bexhill got off to the worst possible start as Blatchly was caught off the first ball of the innings. And after Dassanayake was leg before for 13 and Will Smith caught for six, Bexhill were 33-3. Burgon and Johnson helped get things back on track by adding 47 for the fourth wicket until Johnson fell for 16. Burgon and Johnathan Haffenden put on 35 for the fifth wicket before Burgon departed for 49 off 54 balls with nine fours. Bexhill looked in trouble at 124-6 after Haffenden was out for 16, but led by Peters, they fought back valiantly. They advanced to 150 before Liam Bryant fell for 17 and hopes of victory were raised by an eight wicket partnership of 40. That stand ended when Sarro was out for 13 and Peters departed two runs later for 29. Bexhill’s fate was sealed a further two runs after that when May was last man out for two. Williams was Billingshurst’s top bowler with 5-71 from 16.2 overs, Miller took 3-44 from 11, and there was a wicket each for Barr and Haynes. Sussex Cricket League Division Two standings (all played 14 matches): 1 Mayfield 345pts, 2 Three Bridges 321, 3 Billingshurst 272, 4 St James’s Montefiore 270, 5 Haywards Heath 256, 6 Bognor Regis 222, 7 Chichester Priory Park 204, 8 Ansty 191, 9 BEXHILL 178, 10 Lindfield 137.